I use the word 'friendship' loosely. I was listening to a message on leadership by T.D Jakes on YouTube, where he spoke about certain things pertaining to leadership; character, conflict, and your team. Team being those around you. Hence, my choice of the word friendship. Since we are used to calling everybody our 'friends' anyway. I used to have a habit of saying to people about some other person(s), "He/she is not my friend." Lol. It always used to seem mean. I might be naive in many other things, friendship has never been one of them. I was just built, or rather I grew up knowing not everyone could or would be my friend. It is just not humanly possible for me. Shrug. 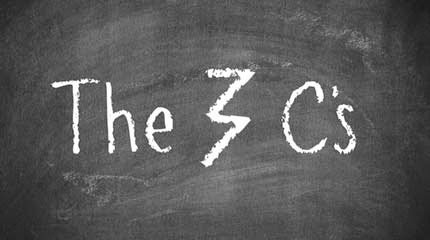 Okay, so according to T.D Jakes, the three categories below, which I termed, 'The Three Cs' are all members of your team, or perhaps a method to select your team. Confidantes: "A person with whom one shares a secret or private matter, trusting them not to repeat it to others. "- Google. These kinds of people are few, of course. We all need at least one of such people in our lives. With these people, you are comfortable in your own skin, to be who you want to be. You can tell them anything, and be sure it will be safe with them. They are with you when you fall, when you rise, when you are stuck. No matter what, a confidante is there. T.D Jakes said if you have only three of such people in a lifetime, you have done incredibly well. That is to say, they are scarce. You know how you sometimes have people around visiting, and you start to get uncomfortable, such that after a while, you just want them to leave? Well, those are not confidantes. You never get tired of confidantes, and since you can be yourself with them anyway, you don't mind them being around. There is a caveat though. You see, you have to feed these confidantes. Not with money, or food or material stuff, but with yourself. Yes, you. Confidantes are not around for your 'cause', whatever that may be. They are around for you. Sure, they believe in that cause, but they mostly do because of you. So, if after a while, you start to become unavailable to them, they begin to fade. As with every plant, and living being they need to be fed: with your time, yourself, your presence, you. If you become so busy that you have no time for them, you realize that they may gradually begin to fade out of your life. Constituents: Now, this is tricky. The people in your constituents are always there for you too, just like confidantes. They have very similar characteristics, except, they are not there for you, but for your 'cause'. Understand that this word 'cause' is used loosely. Your 'cause' may be anything; from your eventual goal in life, something you strongly believe in, your current aspirations...anything. Remember, leadership was what was being discussed. These categories of people are often mistaken as confidantes, because they do practically everything a confidante would. The problem is that they are there for the cause. So, if they are offered a faster route elsewhere, they would take that option and leave you. You start to think you were betrayed, but you really weren't. You just did not recognize that people in your constituents were not your 'friends', they were never there for you, they were there for what they could benefit. On the other hand, if a confidante if offered a 'faster route' or a 'better alternative' to you, confidantes don't leave. They stay. Comrades: Aha. These ones are neither there for you, nor are they with you for your cause. The reason you have these people around is because they are there for what you are against. This is a typical example of 'my enemy's enemy is my friend.' They are fighters. They are probably so frustrated by what you are fighting against, that they will do anything to get rid of it, including team up with you. T.D jakes used the example of the Pharisees and the Sadducees. Both groups of people were certainly not friends, but when it came to antagonizing Jesus, they teamed up really well. Unfortunately, we may think these people are our 'friends' or that they love us, and then we make the dire mistake of confiding in them. When these people leave, because they sure as hell would leave, they can turn back and use the private information we gave them against us. Remember, they are fighters. That's pretty much all they know how to do, fight. Knowing what category each person belongs helps a great deal. A lot of times when we thought we were heartbroken because of a 'friend', it wasn't that we were betrayed, we really just did not understand these people's purpose in our lives. Not everyone is here to stay. Knowing this helps you wade through life even better. Such that even after they leave or do what they know how to do best, hurt you, you are still very cool with them, because you have a perfect understanding of things. You can't be a great leader if everything everybody does hurts you and brings you down. In recent times, I have learnt more than ever the power of emotional strength. Oh, and please for your sake and the sake of your sanity, not everybody you get along with is your friend. Get that into your thick skull, ok? Do that, and watch drama exit your life. Lol. "For survival sake, you have to be able to handle people leaving." - T.D Jakes. Takeaway... Always understand the purpose of the people you have in your life now and also the ones that would be coming in your life later. I have always operated with people on that wavelength; always mindful of this very key essence point of life! Ride on Ifeoluwa.